In Darien CT, (southern Fairfield County). We've had them in previous years - but they are MUCH more numerous this year. Thanks for the attachments. Yep, those are cicada killers all right. You won't have to worry about them though. 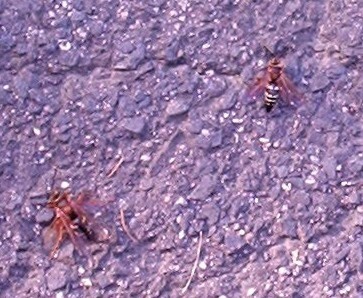 The males have no stingers and the females only sting cicadas. They are not aggressive towards humans at all. In fact, you could probably sit there and watch the females bring in Cicadas. It's quite interesting and fun. Last year, I managed to steal 10 cicadas way from female cicada killers without a problem at all. They just fly away to get more. It's pretty fun. In this way, I get the cicada killer to catch cicadas for me.